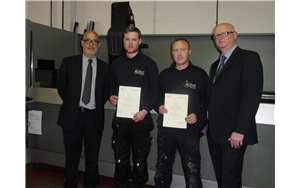 Alifast employees John Eyres and James Moore have successfully completed their 3 year Apprenticeship within Fabrication of Glass Supporting Systems with long standing GQA approved centre North Lancs Training Group. John and James have successfully trained over three years in the fabrication of Aluminium Bi Folding Doors, Windows, Doors and Curtain Walling. The training involved assembly through to the latest CNC machines, consisting of CNC Saw and CNC Preparation. The presentation of their GQA NVQ Level 3 Certificate was made by Roy Pusey (Assessor) and Dave Edwards (Internal Verifier) from NLTG (North Lancs Training Group) Limited. Thanks has to go to both Roy and Dave of NLTG for their continued support and guidance to all Apprentices on GQA NVQ Qualifications.